Sir Frederick William Herschel FRS (15 November 1738 – 25 August 1822) was a German-British astronomer, the greatest observational astronomer of the day. He is best known for discovering Uranus in 1781. He also discovered infrared radiation, binary stars, and published important catalogues of stars and nebulae. Herschel built many telescopes, including the largest in the world at that time. Herschel was also a musician in his younger days. He played the cello, oboe, harpsichord and organ. He composed numerous musical works, including 24 symphonies and many concertos, as well as some church music. Herschel was born in the Electorate of Hanover, one of ten children. His father was of Jewish descent, and an oboist in the Hannover Military Band. In 1755 the Hannoverian Guards regiment, in whose band Wilhelm and his brother Jakob were engaged as oboists, was ordered to England. At the time the crowns of Great Britain and Hanover were united under George II. The next year the brothers resigned from the Guards band, and moved to London to avoid the Seven Years' War.p4 Wilhelm, nineteen years old at this time, learnt the English language quickly. In England he went by the English version of his name, Frederick William Herschel. Herschel's music led him to an interest in mathematics and lenses. His interest in astronomy grew stronger after 1773 and he made the acquaintance of the English Astronomer Royal Nevil Maskelyne. He started building his own reflecting telescopes and would spend up to 16 hours a day grinding and polishing the metal primary mirrors. When he discovered Uranus, Herschel was not looking for a planet but doing a survey of stars; it was an accidental discovery. It was the first discovery of a new planet since ancient times. The first five, Mercury, Venus, Mars, Jupiter and Saturn, are visible with the naked eye, and have been known since early history. Uranus was the first discovered by telescope. Actually, Uranus had been seen before by other observers with telescopes, but had been marked on charts as a fixed star. Herschel found it moved against the background of stars, and at first thought it was a comet. His measurements were used by the French mathematician Pierre Laplace, who worked out its orbit, and proved it was a planet. During the course of his career, he constructed more than four hundred telescopes. He was helped in this by his brother Alexander who, like Caroline, spent all his time working as Herschel's assistant. The largest and most famous of his telescopes was a reflecting telescope with a 48-inch-diameter (1.2 m) main mirror and a 40-foot (12 m) focal length. This was the world's largest telescope from 1789 until it was dismantled (taken apart) 50 years later.p6 The mirror was made of a hard metal alloy of tin and copper, called 'speculum', which he polished by hand. 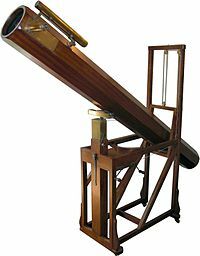 On 28 August 1789, his first night of observation using this instrument, he discovered a new moon of Saturn. A second moon followed within the first month of observation. However, the 40-foot telescope was awkward to use, and most of his observations were done with a smaller 18.5-inch (47 cm) 20-foot-focal-length (6.1 m) reflector. He continued his work as a telescope maker, selling many of them to other astronomers. Together with his pension from the king, the money helped support him and his two siblings in their work. Herschel used to work with his sister Caroline Herschel. She recorded his observations as he made them. In 1783 he gave Caroline a telescope, and she began to make astronomical discoveries in her own right, particularly comets. Caroline discovered eight comets, three nebulae and, at her brother's suggestion, updated and corrected Flamsteed's work on the position of stars. This was published as the British Catalogue of Stars. She was honoured by the Royal Astronomical Society for this work. Caroline also continued to serve as his assistant. Herschel was the first to find out that some line-of-sight apparent double stars were actually true binary star systems where the two stars revolved around each other. This was the first evidence that Newton's laws of gravitation apply outside the Solar System. Herschel discovered 850 binary stars, and worked up the first catalogue of binary stars. His son John Herschel discovered many more, and extended the catalogue. Barnard's Star, six light years away, showing position every 5 years 1985–2005. Herschel studied the changes in star position relative to the Solar System. Changes do occur, and quite rapidly for some nearby stars. Also, the whole Solar System moves, and this was discovered by Herschel. From studying the proper motion of stars, he was the first to realize that the solar system is moving through space. He worked out the approximate direction of that movement. He also studied the structure of the Milky Way and concluded that it was in the shape of a disk. This was also a really significant discovery. On 11 February 1800, Herschel was testing filters for the sun so he could observe sun spots. When using a red filter he found there was a lot of heat produced. Herschel discovered infrared radiation by passing sunlight through a prism and holding a thermometer just beyond the red end of the visible spectrum. This thermometer was meant to be a control to measure the ambient air temperature in the room. He was shocked when it showed a higher temperature than the visible spectrum. Further experimentation led to Herschel's conclusion that there must be an invisible form of light beyond the visible spectrum. William Herschel and his wife Mary had one child, John. In 1816, William was made a Knight of the Royal Guelphic Order by the Prince Regent. Herschel died at Observatory House, Windsor Road, Slough, Buckinghamshire, and is buried at nearby St Laurence's Church, Upton. He died in his 84th year, which is the same number of years Uranus takes to orbit the Sun. His son John Herschel also became a famous astronomer. His sister Caroline returned to Hanover, Germany after the death of her brother. She died on 9 January 1848 at the age of 97. His house at 19 New King Street in Bath, Somerset where he made many telescopes and first observed Uranus, is now home to the Herschel Museum of Astronomy. ↑ This was a major war which involved almost all the European powers from 1756 to 1763. This page was last changed on 20 August 2017, at 20:09.